Phobya's new masterpiece of cooling technology! This is a fan that will satisfy both Silent-PC users and performance-oriented PC builders which is unique on the fan market. This innovative fan will bring fear to it's competitors and keep your system cool with all of it's great features! The manufacturer's consortium Phobya has achieved that an increased Airflow does not necessarily result in higher noise emissions by using an innovative fan blade design. The specially curved fan blades in combination with the unique design and high fan blade density lead the way to the future of cooling! The bearing is quipped with the newest Nano technology which greatly reduces friction and noise emissions. The innovative motor design in combination with an optimally chosen fan speed does the rest to provide exceptional performance and quiet operation. At full speed even the most modern fan will become audible. Therefore the Phobya fans are designed to handle lower voltages well which allows operation in a voltage range of 7-12V. This gives the option of a virtually inaudible operation whilst a strong Airflow will still keep your system cool. The fan is shipped with cables for voltage reduction. These cables reduce the voltage to 7V if desired. All cables are sleeved black which supports the elegant and sleek appearance of the fan. 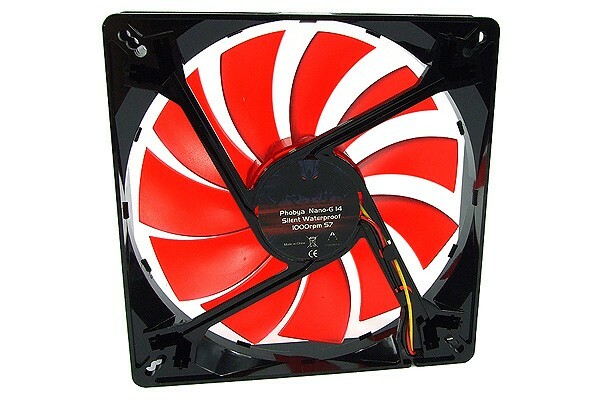 The appearance nowadays also is an extremely important factor when considering a fan. The red fan blades in combination with an elegant black frame, completely in an elegant glossy finish result in a truly spectacular appearance of this fan which is a great choice for any system! For cleaning of the fan the full rotor can be removed by lightly pulling on the frame respectively. Therefore cleaning of the fan can easily be accomplished: Simply hold the fan under running water and rinse off dust and dirt. After a short drying period the fan can be reassembled by simply pushing the rotor back into the casing and the fan can be used again. Kann mich der Rezession von 2015 anschließen. Die Leistung entspricht dem Preis. Achtung! Der Lüfter wird gerne als Bundle zu Radiatoren angeboten. Er ist wenn dann nur für dünne Radiatoren (3cm) mit niedriger FPI-Rate geeignet.